One would think the picture of a six-foot Rick Perry “chia pet” planter would be comment enough. No sir. 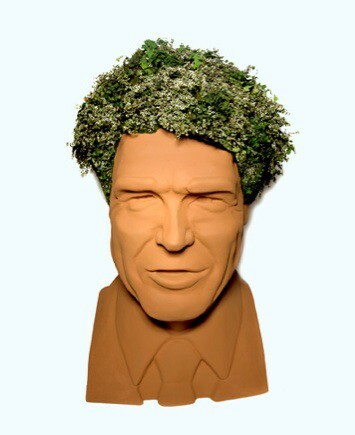 The story behind the chia governor (yours for $4,500) is much, much better (worse?). The bust was initially used by Dairy Waste Management, a company which manufactures Cow Wow, a liquid fertilizer made from dairy cow manure without the manure odor. Last year they commissioned busts of Perry and Bill White, former mayor of Houston and Perry’s opponent in the 2010 gubernatorial election. The “hair” of each candidate was ivy, and voters were asked to vote for their favorite hair (www.votecowwow.com). Nobody had to split hairs in that race — Bill White won by a landslide. Ivy can certainly level a playing scalp. At last year’s ACL Festival in Austin, Rick’s larger-than-life head entertained thousands of concert-goers who kissed his cheeks, picked his nose and admired his ivy. The shrewd buyer of this iconic planter can plop it in the front yard, proud to show a growing support for the presidential candidate. Or head ’em up, move ’em out and circle the Capitol with Rick and his colorful locks in the back of a pickup. Hmmm, Rick recently stated at a Tea Party debate that he would be offended if somebody thought he could be bought for $5,000. He obviously hasn’t evaluated his worth as a gigantic planter. You can secure this bad boy for only $4,500. This one-of-a-kind marvel can be picked up in Blanco, Texas. Bill White’s head is also for sale, if anybody is interested. Bullsh** and “sh*t for brains” jokes also not included. Abe Sauer can be reached at abesauer at gmail dot com. He is on Twitter.